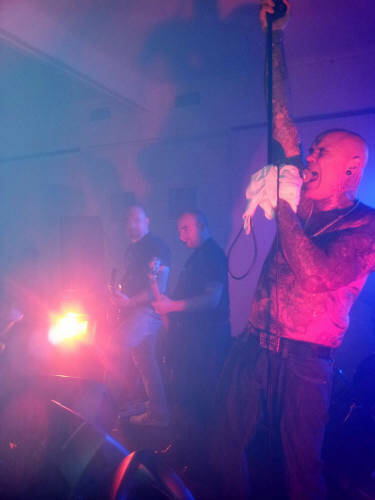 This years concert marked 20 years since the passing of one of our greatest musical performers, political leaders and influences of the modern age, a man who is responsible for the re-birth of nationalism, white pride and unity within England and abroad, Ian Stuart Donaldson. This year also marked 20 years of Blood and Honour being active within Australia. All white nationalists nationwide had 2 big reasons to make this one of the most memorable concerts for years to come. 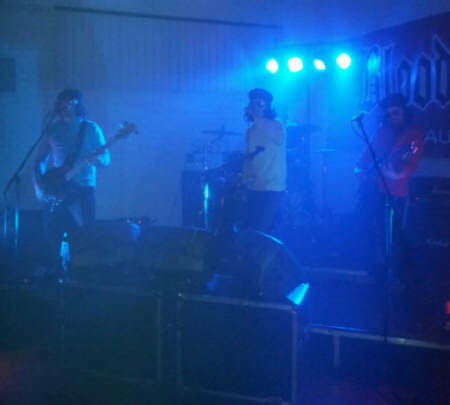 It had been intended to use the occasion to raise much need funds for Bill Hedal, the front man from Westwall, for a radical form of cancer treatment. The news came with much sadness that not 3 weeks leading up to the gig that Bill had sadly passed and all money that had been raised so far went to his family (May he Rest in Valhalla). 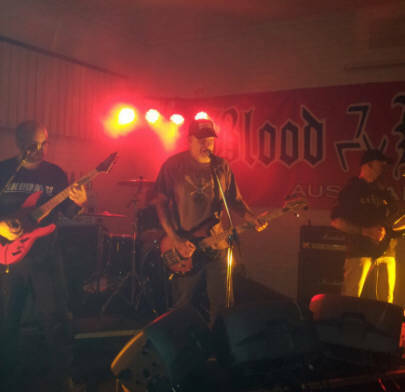 It wasn't without trouble that the Victorian section of Blood and Honour Australia were lucky enough to secure one of the greatest white pride bands ever assembled, Brutal Attack!! The English and Frenchmen arrived a few days before the gig for a chance to soak up some of the irresistible Australian hospitality and culture, Aside from one Frenchmen who happened to have 1 drink too many on the flight over and was delayed in Dubai for a further 20 hours. I was lucky enough to spend some time with the band leading up to the gig and found them to be nothing less than charming and very humble, I was honoured to have Ken single me out a few times and thank me for my efforts toward making the gig a huge success. For most of the crowd the lead up to the gig was per usual, racing back and forth from the airport, catching up with brothers and meeting new faces over dinner and several coldies, but for a few it was racing around like headless chooks assuring everything was in place for the gig worth remembering. Being that in Australia we have a very tight knit group of folk we had many hands making light work easy so with everything running like clockwork the gig kicked off with a huge bang with the ever entertaining local band the 'Commieknockers' arriving on stage dressed as the wiggles with a Che Guevara inspired twist (the infamous hair and aviators), a testament to the band members fantastic sense of humour and with everyone having a laugh along. They wasted no time ripping out some of the old favourites such as Fortress' Hail Rock n Roll and Landsers 88 Rock n Roll Band', sung by one of our female comrades as a guest appearance. The crowd really warmed up as the band belted out their set list and everyone was in the mosh pit at some point during the blasting of all their old favourites. After a quick break to the bar the next band was rearing to go, the sunny Queenslanders band Open Season were on stage ripping out their classics along with a great rendition of Nordic Thunder's tribute to Bob Mathews 'Hail the Order'. I'm sure the local law enforcement heard A.C.A.B blaring as it wasn't long after they conducted their usual sticky beak but didn't interrupt the good time at all. With great admiration and anticipation, Ken Mclellan and Brutal Attack +1 Australian guitarist playing back up guitar took the stage. The cheering alone from seeing such a great rock and roll icon on stage would have been enough to awaken the spirit of Ian Stuart himself! With everyone's eyes focused on the stage Ken began with the infamous ballad 'Embers of Yesterday'. The set was executed with perfection as they blasted some of their greatest songs such as 'Tales of Glory' and one of my personal favourites 'Put your hands in my hands'. The crowd and myself were in awe, Brutal Attack played with such fire and passion you could tell they meant every word they sang, and sang well in honour of the man we all admired. The band performed like true showmen, Ken's undoubtedly powerful stage presence had everyone cheering, raging, singing and dancing along, not one person at the gig wasn't taken by their unbelievable performance. Following their final song, a cover of the band Free's song 'Alright Now' Ken and Blakey pronounced a minute silence in honour of Ian Stuart Donaldson of which they both had the honour of knowing personally. The crowd dropped dead quiet to pay tribute to one of the greatest men of our era, a man who will always live within our hearts and minds with a message that will never be forgotten and that we will always stand by and fight for, Our Blood and Our Honour! 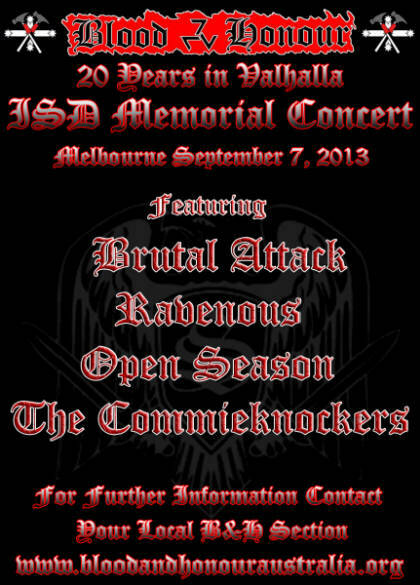 A special thanks to all the bands, Blood & Honour Australia and the Southern Cross Hammerskins, the tireless efforts of all involved were much appreciated.